Monday and Tuesday I’ve been attending a 2-day conference on university-industry relations at UC Irvine at the Beckman Center, which is the West Coast home of the National Academies of Science and Engineering. The conference is the 6th meeting of the University-Industry Development Partnership; UIDP began with its first meeting in December 2006. It is the institutional successor of the University-Industry Congress which was convened from 2003-2006 to address increasingly expensive and contentious university-industry negotiations for IP licensing. Both are under the sponsorship of the National Academies’ Government-University-Industry Research Roundtable. One interesting talk was one on how UCI has succeeded in its second try to act as an innovation hub for Orange County tech entrepreneurs; another was a keynote by Henry Samueli, former UCI professor and co-founder of Broadcom. I also had my own talk on open innovation and university innovations (check back later). All three of these ideas are part of a much broader report of the findings of the 2003-2006 discussion, sponsored by the NAS/NAE GUIRR. These (and much more) are contained in the 20-page booklet Guiding Principles, available for free download from the GUIRR website. (The earlier mentioned HP model of the "Partnership Continuum” can be found in Appendix A of the report). Even though there are UIDP veterans present, participants still talk about the cultural gap between the two-sides in their expectation and mission. I think self-interest is as complete an explanation as culture — both sides are trying to maximize their returns in a zero-sum negotiation. (Growing the pie through massive adoption seems like a better options for both sides). 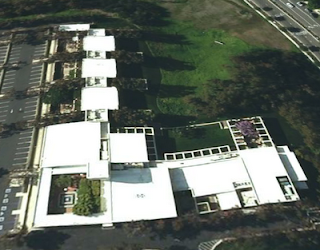 Photo credit: Photo of Beckman Center by Tele-Atlas via Google Earth. It’s mainly about user innovation — not (to quote Jerry Seinfeld) that there’s anything wrong with that. After all, user and open innovation are two facets of the same process. But it recites a lot of the same open source/user innovation linkages that have been made for years, without, for example, talking about more direct linkages (and differences) between open source and open innovation. Reena Jana is down on the article because some of the trends seem stale. I think that might be a little unfair, because she can get her work published online in 24 hours (and in paper within a week) while a journal of McKinsey probably has a lead time like months or even a year. The article gets the concepts of open innovation out to an audience that might not know much about it, and also mentions two of the three open innovation books and von Hippel’s latest user innovation book. I think if someone had read one of the dozens of previously-published open innovation articles, there might not be a lot that’s new. Apparently this is one of the few free articles on the website, intended to generate interest in the Quarterly’s premium content (like last summer’s article on user-generated content).